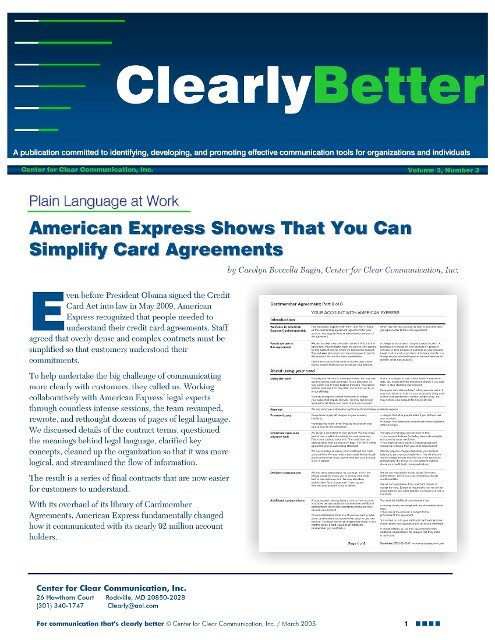 In keeping with its goals of communicating more clearly with customers, American Express came to us with two projects in mind. First, with the AmEx team, we created a new Online Privacy Statement. Seeing that the original was dense and complex, staff knew we could create a ground-breaking, plain-language privacy statement that customers could understand. AmEx convened a team of marketing, privacy, customer service, and legal experts. To help staff visualize the communication process, we mapped customers’ key contact points so the team could see that we covered all important steps. Together we completely rethought the content and developed a fresh, concise online statement. The final privacy statement is online.